Aboriginal elder Auntie Thelma was giving the traditional “Welcome to Country” to a group of academics, farmers, and food activists that had come to an event hosted by Southern Cross University to hear from a diverse panel on the topic of “The New Environmentalism: linking food, environment and political activism.” I was nearing the end of my two-week tour ‘Food for Thought and Action,” organized by Australian activist-writer, Eva Perroni. It had been quite the trip, with a dozen events in Victoria, Queensland, ACT and New South Wales. I meet with permaculturists, environmentalists, organic and conventional farmers, community groups, academics, and journalists, presenting passages from A Foodie’s Guide to Capitalism, “talking story” and swapping strategies. We’d started in Sydney, with a day-long workshop on food policy councils, a morning panel at the University of Sydney with the Sydney Policy Lab, followed by an evening presentation “Building Food Utopias: Voice, Power and Agency,” hosted by the Sydney Environment institute where I was joined by Eva, Dr. Alana Mann of the University of Sydney and farmer Joel Orchard, founder of Future Feeders. My job in these events was to frame the discussion by describing how our food system and global capitalism co-evolved. I argued that we can’t change one without changing the other—and that these big, structural transformations require a strong food movement dedicated to reconstructing the public sphere and dismantling patriarchy, white supremacy and class oppression. This made for lively debates! The trip began in Sydney, but I became aware of my journey in Canberra, Australia’s capital, where Eva and I were met by the indomitable farmer-activist Michael Croft. After an historical explanation of the Canberra landscape, Michael took us to a standing-room-only food and discussion event organized by Slow Food Canberra Capital and Country Convivium. I was on a panel with Meg and Meg (two local women who established a food forest and manage it as a Commons), Charles Massy (Australia’s answer to Wendell Berry and author of the acclaimed Call of the Reed Warbler) and Tyrone Bell, a Ngunawal man and founder of the Thunderstone Cultural and Land Management Services Aboriginal Corporation. Tyrone welcomed us to Country and spoke of indigenous plants and landscapes. He knew his subject—his people have lived in this region for over 21,000 years. Meg and Meg spoke of the importance of the Commons in food systems transformation. Charles Massy—a conventional farmer who switched to ecological practices and regenerated 2000 acres of farmland—described the destruction and decline of industrial agriculture in Australia, and laid out the way forward with regenerative agriculture. I was struck by their complimentary but very different perspectives on agriculture, nature, and society. I’d just started reading Dark emu by Aboriginal author Bruce Pascoe. The book shatters 200 years of western assumptions about Aboriginal life in pre-colonial Australia. The original Australians were not just nomadic hunter-gatherers, opportunistically chasing food about the continent, but farmers of grains and tubers, and fishers with extensive, permanent trapping systems in lakes and rivers. Not only does the archaeological record demonstrate that they were likely the first humans to bake bread some 30,000 years ago (preceding the Egyptians by 15,000 years), but early colonial explorers provide extensive accounts of large, permanent settlements, and vast, richly textured landscape mosaics of intensively-managed agriculture, pasture and forests. Australian native peoples were the planet’s first agroecologists. Today, settler agriculture is in crisis. Climate change is pummeling Australian farmers. Global markets are devastating them financially. Dairy farmers pour milk down the drains in a last gasp to raise prices before going bankrupt. On television, a “Buy a bale for a farmer” campaign is in full swing, as NGOs attempt to keep rancher’s stock alive during the latest drought. Charles Massy’s book gives testimony to this disaster—and to the efforts by farmers, food citizens, and Aboriginal peoples to regenerate agriculture and transform the food system. In Australia, the traditions, practices and politics of the commons, agroecology, permaculture and indigenous landscape management are converging in a widespread effort to transform not just the food system, but society. I saw it expressed on panel after panel in which I participated. 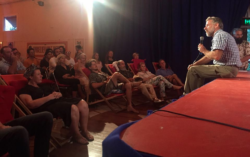 What I experienced in Canberra, Daylesford, and in Lismore was what La Via Campesina has called, “un diálogo de saberes.” Literally “a dialog of different wisdoms,” it refers to our efforts to communicate across different ways of knowing. What struck me in this dialog was the difference between European approaches that concentrated on sustainable farm management and “commoning” within communities, and the indigenous way of irretrievably belonging to a landscape. Our sovereignty is a spiritual notion: the ancestral tie between the land, or ‘mother nature’, and the aboriginal and Torres Strait Islander peoples who were born therefrom, remain attached thereto, and must one day return thither to be united with our ancestors. This link is the basis of the ownership of the soil, or better, of sovereignty. It has never been ceded or extinguished, and co-exists with the sovereignty of the crown. How could it be otherwise? That Aboriginal and Torres Strait Islander peoples possessed a land for sixty millennia and this sacred link disappears from world history in merely the last two hundred years? 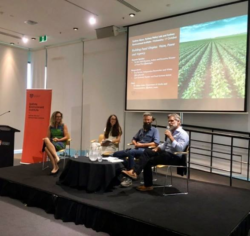 The Australian food movement is grappling with the history and ongoing trauma between these ways of knowing and of being in the world and the politics grounded in the historical inequities of their food system. Many seek an honest acknowledgement of this collective trauma as well as a genuine commitment to the inclusion of different voices and knowledges—including those of recent immigrants—when discussing the future of food and agriculture. The dedication and the difficulties of this dialog reminded me that western efforts to transform the food system almost all take place on indigenous ancestral lands. I came away with the feeling that this engagement could inform social movements globally—as well as determine the future of the Australian food movement.